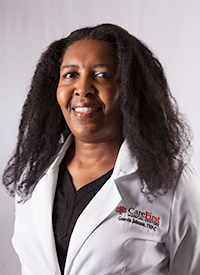 Guerda Johnson is a Family Nurse Practitioner, Board-certified by the American Association of Nurse Practitioners, and Licensed by the state of Texas to provide care to patients of all ages. Her Scope of Practice is centered on disease prevention, health promotion and facilitating the management of common acute and chronic illnesses throughout the lifespan. She began her career in health care as a respiratory therapist with a degree from Tyler Junior College. She later obtained a bachelor's degree in Nursing from The University of Texas at Tyler and later a Master's of Science in nursing to become a nurse practitioner from Chamberlain College of Nursing. Throughout her nursing career, she has had the privileged to work in various health care settings, caring for people from diverse backgrounds and levels of health. Her approach to care is to listen, make the patients feel at ease and take into account the mind, body, and spirit, to promote healing and alleviate pain. CareFirst Medical Centers offers a comprehensive range of services for patients with acute or chronic pain in Tyler Texas. Through the combined expertise of a multidisciplinary team, CareFirst offers advanced treatment options, in a supportive, compassionate, and caring environment. We understand pain is a multifaceted medical problem that can have profound effects on your physical and mental well-being.